The Rosetta spacecraft has the best view of comet 67P, but astronomers right here on Earth are following the famous space rock’s trek across the solar system too. 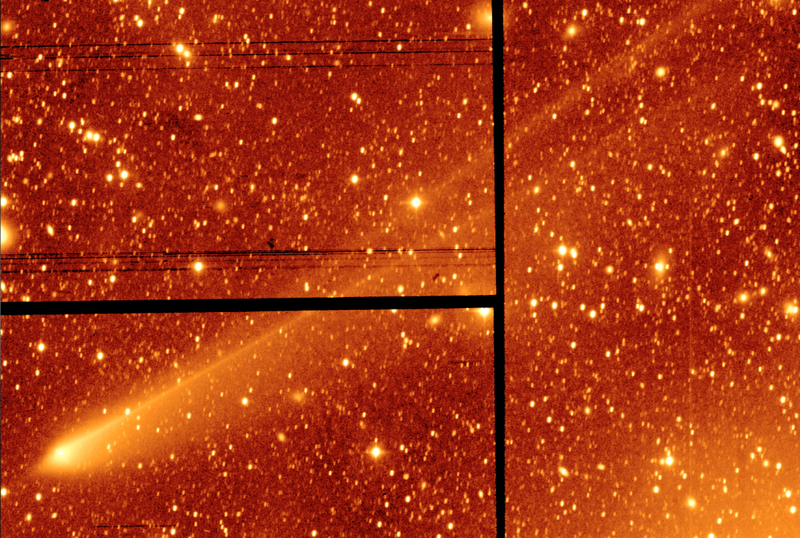 In the image above, they’ve spotted something very strange: The comet has two tails. This shot of 67P was captured by Alan Fitzsimmons on January 19th, 2016, with the Isaac Newton Telescope at the La Palma Observatory. Using a red filter and post-processing to pick out distinct structures, Fitzsimmons was able to spot two separate trails of particles emanating from the icy beast. But fear not, skywatchers: this isn’t a portent of the End Times. In part, it’s an optical illusion caused by the comet’s orbit around the sun. The two streaks are different populations of ice and dust grains, swept away from comet 67P’s surface as it’s battered with radiation. In the image above, an upper “streamer” tail is precisely aligned with 67P’s current path. These are large dust grains emitted from the comet and forming a trail along its orbit. The bottom streak is the dust tail proper. It features a bright central core, which astronomers call a “neckline” structure. This neckline was formed from dust grains released on the “opposite” side of the comet’s orbit, in March of 2015 when 67P was still approaching the Sun. 67P has become one of the most well-studied objects in our solar system, ever since the European Space Agency’s Rosetta spacecraft reached the icy body in November of 2014 and dropped a lander on its surface. As Rosetta runs out of fuel and the chances of making contact with the Philae lander grow ever slimmer, there’s something comforting in the knowledge that we can simply look up into the sky and keep an eye on this incredible scientific endeavor.